Do you need some personal and business results, fast? 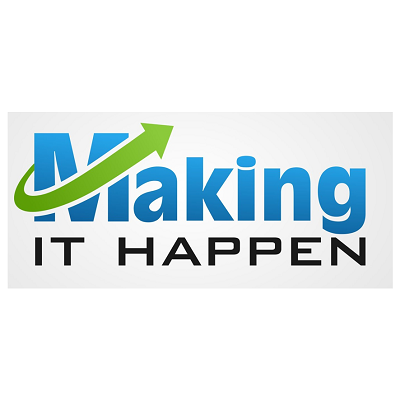 If your business needs to see some dramatic performance results quickly then download Making It Happen today. This instant download provides you with 30+ strategies, tools and approaches that you can apply quickly to your business. Making It Happen is available as a 146 page PDF download with access to 28 downloads (worksheets, templates and explainers). This guide book / course is structured so that you get a quick injection of ideas and strategies immediately to get your improvements up and running quickly. After this you can decide how you want to progress. You can follow the designed sequence (as a structured year of continuous improvement) or take what you need right now and come back to the rest later. You and your business won’t be the same afterwards! This course is not something that will affect you and your business once. The intention behind Making It Happen is that you will not be the same afterwards. Many continuous improvement programmes happen too quickly and sustainable results don’t always appear, that is why this one gives you what I like to call ‘The Year of Continuous Improvement’. Making It Happen is structured so that you can master the material. There’s a lot of great ideas and tools waiting for you in here and I want you to get the most out of the information. The Productivity Boost section is designed to give you a raft of approaches on day one should you decided to follow the lessons in the sequence that they are presented. As you progress through Making It Happen I want you to personally become an even more effective ‘change agent’ and your business to witness improved levels of performance as a side effect. So, what is Making It Happen, exactly? I am offering you access to my continuous improvement toolkit that contains over 30 practical improvement approaches that you can apply to both yourself and your business. Some are designed to develop and expand your own improvement toolkit and some are designed to directly help your business identify and implement improvements. The full agenda, for the ‘year of continual improvement’ can be seen here and includes methods that I have developed for my clients and some more traditional approaches that I have put my own twist on. Towards the end of the year are the ‘sprint projects’, a handful of projects to direct your new skills into tackling some specific improvement projects that I believe every business needs to undertake. When they come, you’ll be ready! One of the reasons that Making It Happen is practical is due to the large number of tools and downloads I have made available to you. When you access the lessons you will most likely find that they have a download associated with them. For most cases this means a worksheet or a template that you can use ‘as is’ or tweak to meet your precise needs. These are usually provided as a Word or Excel file. If you haven’t read any of my books, or subscribed to my emails yet, you might be wondering who I am and why I might have something worthwhile to share with you. In short, Making It Happen is a compendium of the practical tools that I have developed and used with my clients over the past twenty years. Some of the tools are my spin on the classics and others are approaches that I have developed to solve my clients’ generic issues. My background is in manufacturing and since then I have worked with service companies, public sector organisations and every one of them I have been involved with process improvement and business performance. I am a Chartered Engineer with a background in Operations Management. I get excited at the prospect of improving the operational performance of a business and enjoy working with the strategies and tools that I share in Making It Happen. If you want to find out more about me then please feel free to check out my LinkedIn profile or read the About Giles page on my consulting website. But, the bottom line is, that what I am offering you in this product are solutions that work. I see this issue most days when I work with my clients. There are some people that need a few tools to help them with their improvement projects and there are some people that need a few strategies to get their existing toolkit to work. Making It Happen is a phrase that I use repeatedly (so I thought it would make an appropriate name for the materials!) as the ability to do so makes all of the difference. I have met a lot of smart people on my travels that just need a little extra ‘something’ so that they become ultra-productive and start churning out success after success (whether this is an improvement project or the performance of their business). Making It Happen could be that something for you. What I can quite comfortably state is that you are not like the majority of people that don’t want to embrace change and don’t want to make your business work in a more effective and more efficient manner. If you need help to lead the people in your business that are like that then this course is for you too. I like to think that the people that buy this suite of tools are the ones that want build on what they are already achieving and want to see just how high they can push the results for their business and how far they can develop their own skills at making change happen. If this is you then I look forward to welcoming you to Making It Happen. To help you figure out if Making It Happen is for you I offer a 30 day full money back guarantee. If, within the first 30 days, you decide my approaches and methods aren’t for you then just let me know and I’ll organise a full refund for you. To get started just click on the purchase button and follow the prompts to download the PDF guidebook (the links to all of the downloads are contained within the guidebook). As soon as you complete the purchase you’ll have full access to all of the materials. I am confident that applying just one idea will be worth many, many times more than the price you have paid – so dive in when you are ready.